SUMMARY: The Alchemist is a story of a boy named Santiago, who starts out as a shepherd but, prompted by a dream, sets out to find his own “personal legend”. He learns much from the people he meets and experiences that he has along the way, showing the importance of the journey, and of having the courage to follow your heart. When everyone was giving their star ratings for this book, it was interesting how mixed they were. We discussed what some of the reasons for this might be, including: what expectations you had going into the book, where you are in your life and what you are currently dealing with, if you have read similar kinds of books. Another thing we discussed was the repetitive nature of many of the themes of the book – saying the same thing in different ways to get the message across. Some people felt it was effective, others found it a bit heavy handed. Robin moderated the discussion, and she started out by discussing the life of the author, Paulo Coelho. He was born in Rio de Janeiro, Brazil in 1947. He wanted to be a writer, but his parents wanted him to go to law school. At age 16, he was committed to a mental institution, and escaped three times before being released at age 20. He started law school, but dropped out after a year and became a “hippie”, traveling and getting into drugs. He worked as a songwriter, actor, journalist and theater director before becoming an author. In 1986, he walked the 500 mile “Road of Santiago de Compostela” (a major Christian pilgrimage route) in Spain, and it was a turning point for him in which he felt he had a spiritual awakening. He wrote the books The Pilgrimage, and The Alchemist shortly after. He has written over 30 books. It was interesting to note several ways that his life was similar to that of the main character, Santiago, such as: they both wanted to go into a different profession than the one their parents wanted them to and spent a lot of time travelling around, trying different things, and learning from their experiences. 1. At the start of his journey, when Santiago asks a gypsy woman to interpret his dream about a treasure in the Egyptian pyramids, she asks for one tenth of the treasure in return. When Santiago asks the old man to show him the path to the treasure, the old man requests one tenth of his flock as "payment." Both payments represent a different price we have to pay to fulfill a dream; however, only one will yield a true result. Which payment represents false hope? Can you think of examples from your own life when you had to give up something to meet a goal and found the price too high? When you have to give something up for something, it makes you invested in it, which means you are more motivated and it is harder to go back. The gypsy woman asked for a payment of a future “theoretical” treasure, which was easier to consent to than giving up his flock to the old man, which was something he owned and depended on at the current time. Thus it was a greater sacrifice, but also a greater motivator. 2. Paulo Coelho once said that alchemy is all about pursuing our spiritual quest in the physical world as it was given to us. It is the art of transmuting the reality into something sacred, of mixing the sacred and the profane. With this in mind, can you define your Personal Legend? At what time in your life were you first able to act on it? What was your "beginner's luck"? Did anything prevent you from following it to conclusion? Having read The Alchemist, do you know what inner resources you need to continue the journey? Brooke shared her experiences of writing a book, and what she has learned along the way. Some of the issues we experience while trying to realize our own personal legends are: time, health, guilt, naysayers, people who are not supportive. It is important to just keep going, and not get complacent. 3. One of the first major diversions from Santiago's journey was the theft of his money in Tangiers, which forced him into taking a menial job with the crystal merchant. There, Santiago learned many lessons on everything from the art of business to the art of patience. Of all these, which lessons were the most crucial to the pursuit of his Personal Legend? The lesson of patience was very important to him, as well as value of hard work. The experience humbled him, and he learned a lot about dealing with people. He also learned the importance of faith – he had to have faith that the treasure he was looking for even existed. 4. When he talked about the pilgrimage to Mecca, the crystal merchant argued that having a dream is more important than fulfilling it, which is what Santiago was trying to do. Do you agree with Santiago's rationale or crystal merchant's? Having dreams, having hope makes life interesting. We discussed the importance of the journey, which is just as valuable as the destination. There are all kinds of opportunities that can only come when one is actively working toward their goal. The crystal merchant feared that if he realized his goal, then he would have nothing left in life to look forward to, but often your journey opens your mind to new possibilities, and you come up with many new goals and discover new things you would like to do and learn. It is easy to get complacent – change is hard for many people, and the unknown can be scary. The crystal merchant demonstrated this not only by not wanting to actually go to Mecca, but also in resisting having his business grow too much. The more people you meet, the more places you go, the more experiences you have, the more “flavorful” you become. We discussed the idea that you can be “the alchemist” for others, and others can do the same for us. We can teach each other, inspire, and mentor. 5. The Englishman, whom Santiago meets when he joins the caravan to the Egyptian pyramids, is searching for "a universal language, understood by everybody." What is that language? According to the Englishman, what are the parallels between reading and alchemy? 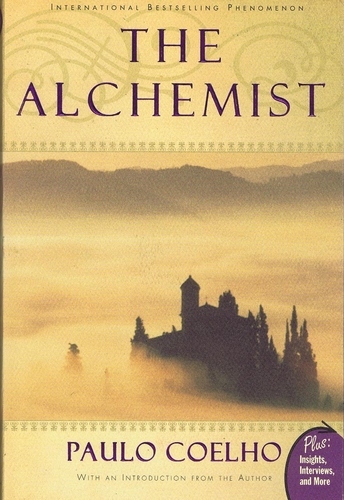 How does the Englishman's search for the alchemist compares to Santiago's search for a treasure? How did the Englishman and Santiago feel about each other? Most people understood the universal language to be love. It was very interesting to note the different learning styles of the Englishman and Santiago. The Englishman learned well from reading books, but Santiago learned better from observing the world. We can respect that people learn in different ways, and can get different things from the same experience/book/etc. 6. The alchemist tells Santiago "you don't have to understand the desert: all you have to do is contemplate a simple grain of sand, and you will see in it all the marvels of creation." With this in mind, why do you think the alchemist chose to befriend Santiago, though he knew that the Englishman was the one looking for him? What is the meaning of two dead hawks and the falcon in the oasis? At one point the alchemist explains to Santiago the secret of successfully turning metal into gold. How does this process compare to finding a Personal Legend? The Alchemist sought out Santiago, because Santiago needed his wisdom at the time. When comparing turning metal into gold, and finding a personal legend, both require one to work for it, learning from the process/journey. 7. Santiago became a shepherd rather than a priest as his parents had hoped. Why is this so significant to the story? What advantage does being a shepherd offer him? One of the biggest advantages was the thing that drew Santiago shepherding in the first place – the ability to travel. Being a shepherd instead of a priest made it so he was available and flexible enough to follow his own personal legend. Being a shepherd also taught him to observe the earth, universe, and to fight for his independence. He needed to pick his own path. In the introduction of the book, the author lists four obstacles which keep people from fulfilling their own personal legend: 1. From childhood onward, we are told that everything we want to do is impossible, 2. Love, 3. Fear of defeats we will meet on the path, 4. Fear of actually realizing the dream. We discussed how sometimes a goal really doesn’t turn out to be all you hoped it would. You need to go through the emotional work and courage to dream again, and look at what you learned/gained from the journey. For some reason, a lot of people stop right when they are on the cusp of success – Why? Maybe risk, change, fear of expectations. Sometimes during the journey we find out the goal we have in mind is not the final destination, but a stepping stone to greater things. 8. Many spiritual quests involve a journey into the desert. Why do you think that is? In what ways is the desert a perfect setting for a spiritual journey? How did the desert help Santiago on his journey? Someone brought up a quote from the Dali Lama on what surprised him most – “Man, because he sacrifices his health in order to make money. Then he sacrifices money to recuperate his health. And then he is so anxious about the future that he does not enjoy the present; the result being that he does not live in the present or the future; he lives as if he is never going to die, and then he dies having never really lived.” This quote demonstrates why it is important to slow down, and focus on what is essential. 9. Why did Santiago have to go through the dangers of tribal wars on the outskirts of the oasis in order to reach the pyramids? At the very end of the journey, why did the alchemist leave Santiago alone to complete it? Santiago had to search deep within himself. The Alchemist set up the test, and Santiago had to go through with it to test himself. Every teacher eventually gets to a point where they have to stand back and let their student sink or swim. It was the second time Santiago had had everything taken from him, he had to figure out how to keep going. He allowed God into his life, and learned to rise above the physical. The Alchemist was his mentor for discovering how to rely on God, which ties into the theme of “things conspiring to aid you” on your journey. 10. Earlier in the story, the alchemist told Santiago "when you possess great treasures within you, and try to tell others of them, seldom are you believed." At the end of the story, how did this simple lesson save Santiago's life? How did it lead him back to the treasure he was looking for?